The boot menu from Unetbootin was quite usual: boot SolusOS Live, start the installation, check the media, boot from HDD and so on. Nothing unexpected was there. My choice was to start a Live USB session of Solus OS 1.2 Eveline. Soon after I made my choice, the splash screen appeared. It was a starry sky with Solus OS logo on it, and with a planet in the right part. There was some animation on the planet image, which looked quite nice. The boot process was not long at all. Soon I saw the black screen with GNOME's rotating "wait" cursor, and then the desktop appeared. Freshly booted Solus OS 1.2 took just below 150 Mb of memory, which is quite decent for the "GNOME on Debian" combination. Under the hood, you can find that Solus OS 1.2 Eveline runs GNOME 2.30 with Linux kernel 3.3.6. Solus OS 1.2 presents a desktop layout which should be familiar to most computer users: Desktop with some icons in it and a single panel at the bottom. The panel and all its elements are in black-grey-white gamma. The left corner of the panel contains a Menu button with the Solus OS logo on it. The menu itself is not the GNOME standard. Instead, Solus OS uses the menu from Cardapio Project. The right part of the panel has the notification area, which is not overloaded with different items. I only saw clocks, Pidgin messenger icon, Volume control, Battery monitor and Network Manager there. Although there are some strange design decisions in that notification area. First of all, the green battery icon does not live in perfect harmony with otherwise grey&white elements. This is the similar issue with Linux Mint 13 Maya, however Solus OS's icon is in light pastel green colour, which does not jump out of the surroundings too much. Second issue is that some elements of the notification area are placed within the black rectangle, while others are on the grey panel background. The reason is unknown to me. The rest of the panel is taken by the taskbar. The active application has a black button on it, while others have the buttons of the same colour as the panel, making the panel looking solid, just with some text on it. The button changes the colour slightly toward blue when you hover the mouse over it. As you can notice, there's no "Show desktop" button or virtual desktop switch in the default Solus OS distribution. Both these items are available, but you need to add them to the panel manually. The desktop has a blue-themed wallpaper with the Solus OS logo on it. If you do not like the default wallpaper, then Solus OS gives you a choice among two dozen others, although most of them are Solus OS - branded. There are some icons on the desktop: Home, Computer, Install Solus OS and Wastebasket. There are no visual effects active in the default Solus OS 1.2 distribution, although you can find tools for this in the Control Centre: Compiz and Emerald Theme manager with all their arsenal are available out of the box. To be honest, I did not activate Compiz in my Live run, so I won't say if it works or not. Solus OS comes well prepared for network connectivity. Whereas Debian always had issues with my WiFi network card Intel 3945 ABG, Solus OS 1.2 Eveline immediately recognised and configured my wireless card. I only had to choose my home network from the list and type in the security key. The default keyboard layout in the Solus OS 1.2 is English UK. I did not adjust it: this is the default option. This may give some annoyances to users in other parts of the world, as English US is the most widely used layout, but it suited me perfectly. If you want to change the layout, the Keyboard menu item in System Settings section is your next stop. I managed to add Russian to the default English UK layout in no time. Although the system suggested I use "Both Alts together" as a switch hotkey, I changed this to my favourite Ctrl-Shift. As soon as I added the second layout, an item appeared in the notification area, showing the current layout. Unfortunately, this icon can only be a text, not a flag. There are two network-related items in the Places part of the menu in Solus OS: Network and Connect to Server. The first is just a network browser, which unfortunately could not see my home fileserver. The second was a much better choice, as I was able to point it to my server and share names. The mounting happened quickly without any issues. As I have mentioned above, Solus OS 1.2 comes with the Cardapio menu by default, though you can replace it with GNOME standard menu using the Panel Settings. This menu has one button, as opposite to the "Applications - Places - System" trinity of GNOME "classic". The menu itself has 2 columns, where the left column contains groups of applications and a search field, and the right panel shows items within the group. "Places" and "Control Centre" (yes, it is spelled Centre, which proves the British origin of the distribution once again) are some of the "groups" in the left column. If you select All in the left column, then you can browse the whole applications menu on the right, but still separated into subsections. You can call the menu by clicking the button or by pressing the Windows (Super) key on the keyboard. Though this Super key has little use: I have not found a way to navigate through the menu from the keyboard, you still need a mouse. Firefox 14.0.1 is the only browser in the Solus OS, though it was not made default: you have this question on the first run. After running for few minutes, Firefox asked me to disable a Java plugin and to restart. I think this is somehow linked to vulnerabilities found in Java recently, but I won't say this for sure. Apart from Firefox, you can find Transmission torrent client, Thunderbird mail client, xChat IRC, Pidgin internet messenger and Dropbox client installer in the Internet section of the menu. The Graphics section of the Solus OS 1.2 menu is not very rich. There is a simple GNU Paint editor, gThumb viewer and Simple Scan tool. Of course, LibreOffice Draw is also available, but in yet another part of the menu. The Office menu group includes LibreOffice applications like Calc, Writer, Base, Draw and Impress. They have version 3.6. In addition, there is a Dictionary application. There is a Games section in the menu, but... there are no games! Instead, you can find the Play On Linux tool there, which you can use to install Windows games in your Solus Operating System. If you remember, I pointed out the lack of applications in the Graphics group of the menu in this operating system. In contrast to that, the Sound & Video section is very rich. There are several multimedia players, including GNOME MPlayer and VLC, several Pulse Audio configuration utilities, Sound Recorder, Brasero disk burner, OpenShot video editor and so on. The Accessories and System tools include a more or less standard set of applications: gEdit, calculator, terminal, Ark archiver, System Monitor, HTop, Disk utility, Deja Dup backup utility and so on. Synaptic is the package manager in Solus OS 1.2. It means that all the Debian repositories are available for you. By default, Solus OS 1.2 uses the Debian Stable repository, including the non-free repository, plus Debian-multimedia, Debian backports and Solus OS's own repositories. I think there is no point in listing all available software that you can find for Debian. Totem Movie Player is the default player for MP3 files. It started playback of my MP3 and WMA files straight away: no additional software installation is required. Solus OS comes with the necessary codecs. As you can imagine, Solus OS comes with Flash Player installed too. There were no issues in watching videos on YouTube, BBC iPlayer and other sites. Unfortunately, there was a small drop of rough tar at the end of my Live USB session of Solus OS 1.2 Eveline. This operating system did not want to shutdown properly. I had to use the Power button for this. Unfortunately, the future is not that clear for Solus OS. The concern which I'd like to express here is the future of GNOME 2. Solus OS uses it, but for how long will it be supported? And what will happen when support ceases? I doubt that the team under the Solus OS brand will be able to support this monster by themselves. The second issue is that, although there are several developers listed on the official web site, Solus OS is more or less an "one-man-band". And this man, Ikey, has some bills to pay, has some personal life and so on. It means that the development of the project is under big question. And last but not least, is the intention to move from the "rock-solid" Debian base, which I have mentioned several times in this review, to own repository, based on PiSi package system, like in Pardus. I am not sure that the system will be equally stable after this move, and that all the applications you need will be available. 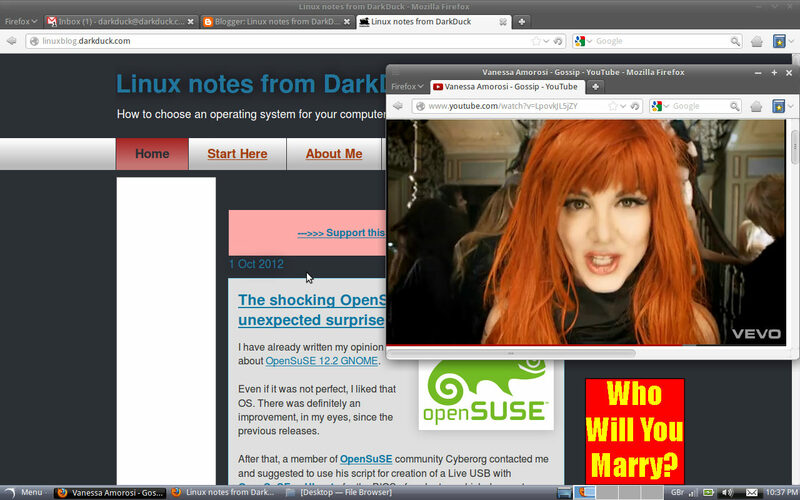 Look at what is available for Pardus compared to Debian to have a live example. Let's come back to today, anyway. Solus OS 1.2 Eveline behaved itself reasonably well in my Live USB run. However, I had some sudden application shutdowns without any visible cause. I think the reason is in the Live session, which probably had some issues with memory. Another reason could be in issues with the applications, and some of them are being addressed by the Solus OS team. Otherwise, the operating system was fast, responsive and stable, even in my Live run. In other words, if you are looking for an operating system with rock solid fundamentals but enriched with all the multimedia tools, and if you don't like the workflow which GNOME Shell or Unity push on you, then you should look at Solus OS 1.2. This operating system would be suitable for both beginners and experienced users. You may also like the Solus OS 1.2 Eveline review by one of my readers. Update 28.12.2013: Solus OS is discountinued. All the links to their web site removed. Hi. Where did you get your .torrent file for this? Linux Tracker is saying it can't find the file. I took the torrent file here. It worked for me. @DarkDuck: This is a pretty good, interesting, and comprehensive review. I'd like to touch on a few of the points you raised regarding the future of SolusOS. 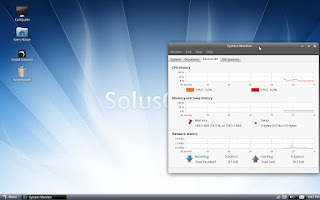 SolusOS 2, which should have a beta release out soon and a final release around the same time as that of Debian 7 "Wheezy", will use a heavily-modified GNOME 3 environment which should behave exactly as GNOME 2 does currently in SolusOS. This means there will be no "Shell" nonsense; the panel, menu, desktop customization, and Compiz will all work as they do now. I also raised the issue of this being a one-man show with Mr. Doherty, but he has assured me and others that although he is the lead developer, the other developers do contribute to a significant portion of the project as well, so it is not a one-man show despite appearances otherwise. PV, I know distributions which exist as "one-man-band" for long time, and I know distributions which fall over even with bigger teams. So, the number of developers is not the decisive factor. Though, low number increases the risk. "The concern which I'd like to express here is the future of GNOME 2. Solus OS uses it, but for how long will it be supported?" Until Red Hat 6.x is supported (2020). So, for a long-long time. Thanks for an update with some good news! I believe Ikey is working on something that will be his own desktop, maybe like Zorin has it's own desktop. Just so everyone is aware work has already begun on SolusOS2. We will be using our own version of the fallback mode of Gnome 3. This "desktop environment" needs a name. It is actually bad and good. First, GNOME 3 still proves its usability, though without Shell for yet one more time. Second, the number of forks becomes too high, IMHO. Zorin, Cinnamon, Solus, who's next? I've been using RedOS Sibux from Siberia but would love to try this now. Thanks! Can you give us a link to this RedOS? I could not find it! Unfortunately, the future is not that clear for Solus OS." Given that you linked to a post in which I clarified every point, the future of SolusOS is crystal clear." "The concern which I'd like to express here is the future of GNOME 2. Solus OS uses it, but for how long will it be supported? And what will happen when support ceases? I doubt that the team under the Solus OS brand will be able to support this monster by themselves." SolusOS 2 is going to feature its own desktop environment based on a modified Gnome Classic (3.4) codebase. The work for this is already complete. "The second issue is that, although there are several developers listed on the official web site, Solus OS is more or less an "one-man-band". And this man, Ikey, has some bills to pay, has some personal life and so on. It means that the development of the project is under big question. " Again, I see no reason why people need to use my personal life against me. Doesn't everyone have to pay bills? If you have questions regarding SolusOS future, I'm more than happy to address them on Google+, as I do quite frequently. 30K Debian Packages are built from around 6K source packages. This means a lot less actual packaging involved. and all dkms reliant packages. with. Me and a few of the guys will make our changes, and will be using stripped down versions of what Wheezy uses. This means multiarch and binary compatibility with Wheezy. That said all Debian/@Canonical patches are going to be immediately blacklisted if it appears they are to enhance the experience in a Debian or Canonical way. This means less overhead and useless cruft. and virtualbox, which I'm also happy to repackage. Consider the existing workload. SolusOS Eveline has a 15GB package repository containing around 8K debain packages. as well as automate the testing process for backports and security updates through a testing buildfarm. A far more elegant solution, we ensure stability from a variety of sources. from the repository. I'm quite convinced that SolusOS 2 will actually feature a larger repository than even that of Debian by the time we hit RC stage. issues and instabilities. Many a time nvidia + libreoffice, for example, have been killed by a combination of Debian updates, and in the libreoffice case, backports. So as to the stability notion, the move to a self-controlling distribution, i.e. independent, is actually required to keep high standards within the project. As a question, why have you decided to fork GNOME3, if GNOME2 is still supported until 2020, as per post above? Everything else is new apps, i.e the panel, or patched to fit in better. And regarding forks, well, maybe someone should do it right for once. Solus OS is based on Debian. Why should it use GRUB? Of course, GRUB2! Thanks for sharing the news, Matthias! Very pleased with it so far though there are intermittent problems with sound which I haven't fixed yet - I suspect Flash as they don't happen with sound files on the hard drive. One small problem in an excellent OS. Thanks for your comments, Stephen! I hope you will stay with SolusOS for long time and will enjoy it even more! Hi, Solus OS is discontinued, sorry. I don't think you can install it on top of Ubuntu.